Exchange rates fluctuate. Sometimes more, sometimes less. For instance, the British pound experienced a sharp depreciation in June 2016 as a result of the Brexit referendum. In contrast, the Swiss franc appreciated massively with the abolition of the EUR/CHF minimum exchange rate in early 2015. Both can present problems for companies that export or import. It is important to know your company's currency risks. A distinction can be made here between transaction risk, currency translation risk, and economic risk. Transaction risks arise when purchases or sales in foreign currencies are arranged for a date in the future as the exchange rate on that date is not known when the contract is signed. The machines ordered may potentially be more expensive because the contract currency appreciated. Or a product must be sold at a cheaper price because the exchange rate as of the time of the sale is lower than when the contract was signed. 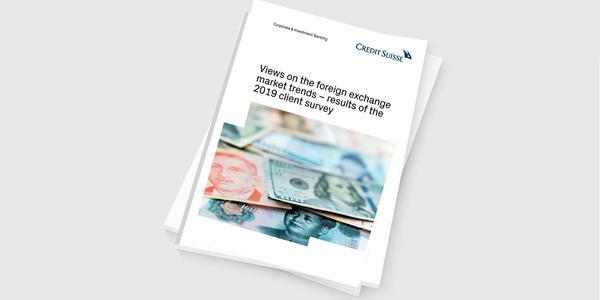 The Credit Suisse study on exchange rates and currency hedging surveyed 766 companies on the topic of currency management. The survey shows: The majority hedges currency risks completely or partially. Learn more about the reasons. In contrast, a currency translation risk exists when there are foreign currency positions on the balance sheet. These must be converted into the balance sheet currency on the reporting date. Depending on how exchange rates develop, this can lead to a loss, for instance if a currency depreciates right before the reporting date. Finally, economic risk refers to changes in the exchange rate that impact the competitiveness of domestic companies. For instance, the strong franc made Swiss products more expensive abroad – Swiss companies were less competitive. In some cases, currency hedging is done quite naturally, e.g. when purchases and sales are processed in the same currency. The current Credit Suisse corporate client survey on the topic of currency management shows that exporters in particular are more often naturally hedged. 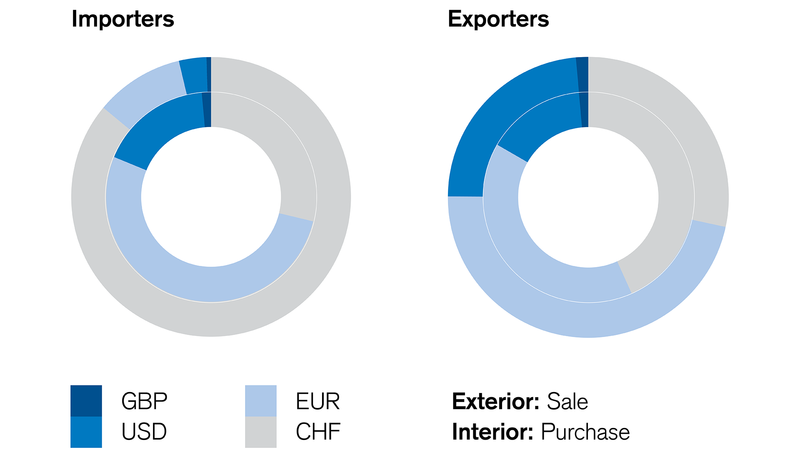 Importers, in contrast, often only make purchases in foreign currency, but sell almost exclusively in Swiss francs. Exporters are more often "naturally hedged"
Companies can further optimize natural hedging. For example, it would be possible to move part of production and thus part of the costs abroad. Alternatively, contracts in Swiss francs can be negotiated. Of course, it would be particularly efficient for Swiss companies if they could always invoice in francs. However, this is rarely feasible for SMEs. Switzerland's domestic market is too small for that. "Accordingly, in Switzerland as in virtually no other country, small and medium-sized enterprises are also exposed to significant currency risks," says Andreas Gerber, Head of SME Switzerland at Credit Suisse, as part of the study. If natural hedging is insufficient or if no natural hedging can be achieved, companies can financially hedge the currency risk. There are various financial products for this purpose on the market. They can be used to hedge transactions and set the exchange rates for a specific date in the future. Through currency hedging, companies can achieve planning security, protect their cash flow and turnover, as well as reduce the risk of value loss. With a forward contract, companies set the exchange rate for a specific date in the future in advance, thereby hedging against exchange rate fluctuations. Forward contracts are traded over-the-counter (OTC) and can be tailored to the needs of a company. An option is similar to insurance. Companies use it to hedge against unfavorable exchange rate fluctuations. At the same time, they can continue to benefit from favorable exchange rate developments. As with insurance, a premium is paid for the option. Currency hedging, however, is not free of charge. Costs and benefits must be commensurate. It is therefore imperative to find the right strategy for your company. What transactions must be hedged? How much residual risk can be taken? Generally, it is a good idea to hedge longer-term contracts without exception and to forgo currency hedging for short-term business. Hedging instruments can also be used generally to speculate on rising or falling exchange rates. However, this is not advisable. Speculation of this kind for potential profit involves too great a risk for companies. Even those who do not hedge indirectly speculate. Namely, that the exchange rates will remain constant or develop in favor of the company. However, there is absolutely no guarantee of this. Hedging currency risks can protect a company from financial problems. The bigger a company's operations abroad are, the more important it is for that company to protect itself against currency risks. Others have also had this experience. As part of the Credit Suisse study, entrepreneurs reveal in interviews why they hedge currency risks and what experiences they have had to date with currency hedging. Do you have any questions about currency hedging?